Figure 1. The nodular and ulcerated lesions with a purulent base. An 80-year-old woman presents with painful eroded blisters on her hands. 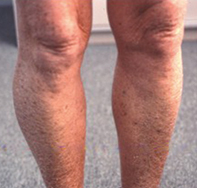 A 45-year-old man presents with a scaly brown rash on his lower legs. What is the diagnosis and how should this patient be managed? Figure 1. Hypopigmented macules on the back (case patient). A 7-year-old girl presents with a small number of hypopigmented macules on her back. 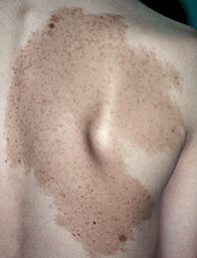 A 15-year-old boy presents with a large speckled lesion on his back. Figure. Hyperpigmented and thickened skin on the axilla. A 14-year-old girl presents with areas of thickened and hyperpigmented axillary skin. Figure. The lesion on the baby's scalp. 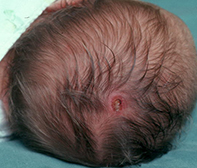 An otherwise healthy newborn baby is noticed to have a small eroded lesion on the scalp. What is its cause and appropriate management? An 8-month-old boy presents with an oedematous and purpuric eruption on his trunk. What is the cause and is specific treatment required? 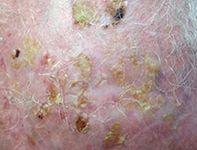 An elderly man presents with multiple crusted lesions on his scalp. What is the cause and how should the problem be managed? A 70-year-old woman presents with a submammary rash that has been present for several weeks. What has caused this persistent eruption? A 12-year-old girl presents with loss of skin colour on both of her hands. What is the correct diagnosis and how should this patient be managed?